Yeah, it's a "runner" game. You control a character that's perpetually moving forward, and all you have to do is move them left to right and sometimes roll or jump as well. And yeah, it's a "freemium" game, something I will likely never really embrace. 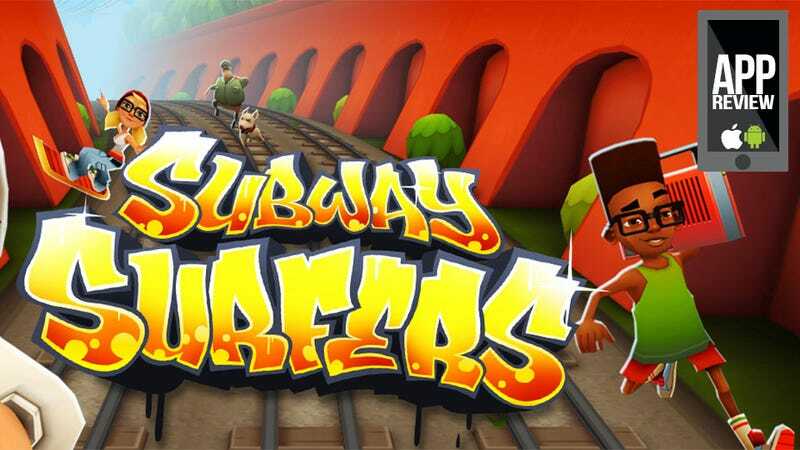 But man, I'm enjoying Subway Surfers all the same. The key is that not only is it fun to play for free (stages are generated randomly, so you never hit a "wall"), but it's got real style, with a bubbly look that should be coming off as ridiculous but instead feels like a Nickelodeon tribute to the early 90s. In terms of how it plays, like say, Temple Run, you're in command of a character constantly running away from the screen, with swipes of your device either moving them between "paths" or over/under obstacles. You can collect coins in missions to unlock items, or, of course, you can buy those items right away with real cash. If you've got multiple devices or platforms, the iPad version is probably the best (especially if you've got a retina display), as the dedicated visuals really pop.